• You don't have to memorize a key combination. • You can display the name of the macro as part of the button. • You can add it to both a menu and a toolbar, and you can group it with other buttons that are related in some way. 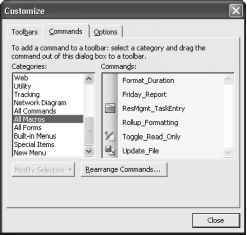 Beginning with Microsoft Project 2000, menus are treated just like toolbars; you can add, modify, or even delete menus and menu commands as desired. A macro is not associated with a toolbar button when you record it. 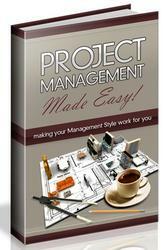 Instead, you actually customize the Microsoft Project interface by using the Customize dialog box. 1 Click View, Toolbars, Customize. You can also simply right-click in the toolbar area and then click Customize on the shortcut menu. 2 Click the Commands tab and then click All Macros in the Categories list (see Figure 27-4). Figure 27-4. Open the Customize dialog box to choose a macro to add as a toolbar button. 3 Click the name of a macro in the Commands list and then drag it to the desired location on any toolbar or menu (see Figure 27-5). Figure 27-5. Add your macro to any toolbar or menu in Microsoft Project. When you create a toolbar button for a macro, the button initially displays just the name of the macro. You can modify the new button in many ways, including renaming it, assigning an image to it, or changing its display style. You can even edit the image used for a button or draw your own. 1 Click View, Toolbars, Customize. 2 While the Customize dialog box is open, click the toolbar button for which you want to display an image. When the Customize dialog box is displayed, clicking a toolbar button doesn't run the macro or command; instead, it selects the button. When selected, the button has a black border. 3 In the Customize dialog box, click the Commands tab. 4 Click the Modify Selection button. 5 Point to Change Button Image and then click the graphic you want to use for your selected toolbar button. 6 Click the Modify Selection button again and then click Default Style. The button displays the image you selected, but the name of the macro appears only as a ScreenTip when you move the mouse pointer over the button. The Name box on the Modify Selection menu is used for both the caption and the ScreenTip of the button you're modifying. You can change this text to whatever suits you without also changing the name of the macro itself. For more information about customizing Microsoft Project toolbars and menus, see Chapter 26, "Customizing the Microsoft Project Interface."